By the way, the copy editor went through my book and removed practically all the hyphens. I’m sure she would take the hyphen out of the “camera-less” in my post title there. Today is shelter animal day, or something animal day, and there are related events going on at Union Square and up at the Wild Bird Fund, and I’m planning on stopping by. But it’s killing me that I won’t be able to photograph the animals and birds. KILLING. I am so frustrated. My birthday is off to a great start though, because Buddy just ate two cans of food and now he is eating Finney’s food. He is pretty unequivocally getting better. So, you’ve all heard the news about Amelia Earhart, right? It’s upsetting that the distress calls that were dismissed as bogus might have been genuine. Could she have been saved had they not been ignored? What picture am I going to put here?? Here’s a shot I took a few weeks ago of a guy walking dogs. 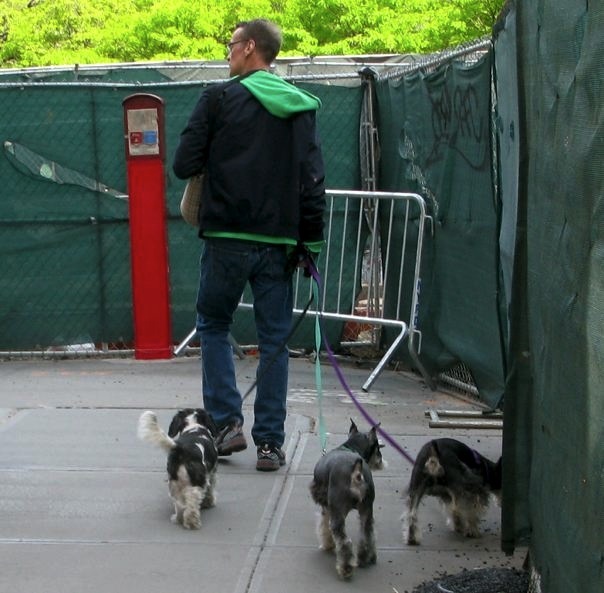 I always take pictures of dog walkers, because I always wish I was the dog walker. Happy Birthday, Stacy! And that’s great news about Buddy! Happy Birthday! I am so glad that Buddy is getting better! Happy, happy, happy Birthday! Best present ever: Buddy improving. I miss your photos too, since I live vicariously through your shots of NYC. Sending happy birthday wishes your way Stacy! Sorry about your camera, Stacy, but I hope its a good b’day anyway. Thank you thank you all! Yes, I’m very happy about Buddy. Temporary reprieve! Happy Birthday! I hope Buddy has many more weeks and months of temporary reprieve in front of him. What a great birthday present from Buddy — I know that there is nothing more that you could want than a cat that chows down. Happy Birthday (sorry I’m a day late). Please, no need to apologize! Buddy is still doing well, so I’m still in a great mood. He’s beating the odds again, it seems.